“My body really, really hurts,” she’d moan. “I wish I could do something,” he’d say. caused her even more pain. whatever she needed to do. What I didn’t tell him, but should have, was that he was doing something just by being awake with me. 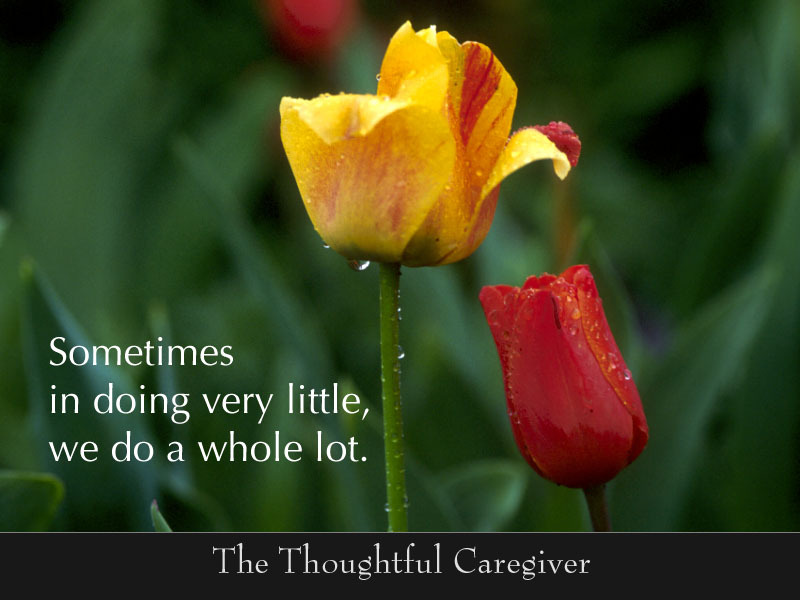 I began to understand that taking care of someone doesn’t always mean doing something for that person; there isn’t always a hot toddy or a water bottle or an ointment to soothe. Being is just as important as doing. Being awake. Being present in the next chair. Being funny. Being smart in a surprising, useful way. Being sympathetically perplexed. Being a mirror for the expression of pain. So do legions of other care receivers. that we understand as well as we’re able. letting them see our face too. sensing that’s what they need. if we sense that’s what they need. without showing discomfort or alarm. we’re doing anything at all. The difference itself is what ultimately matters. This entry was posted on February 4, 2008 at 12:02 pm and is filed under Caregiver Truths, Caregiving, Caregiving Lessons. You can follow any responses to this entry through the RSS 2.0 feed. You can leave a response, or trackback from your own site.